On Friday May 18, the world of tourism came to Virginia City, once known as “the richest place on earth” and cleaned up the town. Seventy volunteers cleared brush at the Silver Terrace Cemeteries. Some 300 men and women from around America came to Virginia City at their own expense to spend a day working on dozens of tasks — some of them long overdue — around the historic community. In white t-shirts and tan caps they fanned out through town, painting, scraping, prying, drilling, polishing hoeing, raking, sweeping and shoveling as they went. 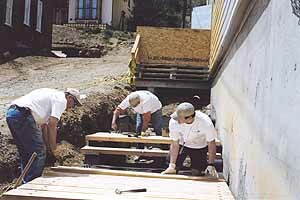 These men and women work mostly for tour companies and tourism promotion offices, and they came to Virginia City at the call of Tourism Cares, a non-profit charity supported primarily by the tourism industry. They were everywhere, doing everything. 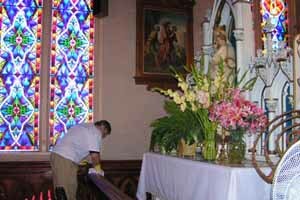 Among the volunteers working at St. Mary’s in the Mountains was Steve Richer, executive Director of the Mississippi Gulf Coast Convention & Visitors Bureau, pictured at right polishing the altar rail of the old church with beeswax, just as they did it in the 19th century. Steve was Nevada’s first Director of Tourism when the Commission on Tourism was created in 1983, so he had two good reasons for being here: as payback for the volunteers who came to the Gulf Coast last year, and for auld lang syne. The Historic Fourth Ward School Museum is an imposing Victorian schoolhouse built in 1876 after the great fire of the previous year. The four-story building could accommodate as many as a thousand students, and boasted state-of-the-art heating, ventilation, and sanitation systems, as well as water piped to all floors. At the Fourth Ward School Museum, Tourism Cares volunteers did years of work in one day. inventorying, filing and cross-referencing old school registers, research files and photographs, and as the day proceeded, new recruits appeared (some of them with sunburned ears). One team worked on describing, photographing and packing away a unique collection of 19th century clothing — wedding dresses, graduation dresses, dresses and garments of all kinds — dating from Virginia City’s bonanza years of the 1870s. “It would take my four part-time volunteers several years to do what was accomplished in that one day,” says Barbara Mackay, the Museum’s executive director. The old Opera House was tended to on all sides. another important venue for the volunteers. “There was some clean-up and some light carpentry to do,” said Maintenance Manager Bo Johansson, “but the biggest part of our project was installing the board sidewalk on the south side of the building. That’s a big job, and to tell you the truth, we were skeptical that a bunch of volunteers could do it.” But he and his crew spent 2 weeks prepping the job, and at 8 am Friday morning 25 people with skills and experience showed up to help. The new sidewalk went down without a hitch. Painters spruced up the old hospital, now Saint Mary’s Art Center. 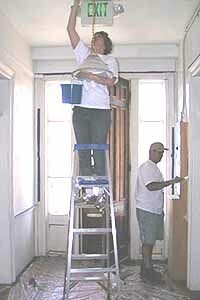 At St. Mary’s Art Center 21 volunteers spent the day painting all the public areas in the 131-year-old structure, from the attic down to the ground floor. “They worked non-stop, took 15 minutes for lunch and went right back at it,” Executive Director Linda Nazemian told me. “They did a terrific job. Other volunteers worked on the railroad, clearing flammable brush from along the right of way, and cleaning up the unrestored rolling stock. The Sisters of Charity built St. Mary Louise hospital in 1876 to serve the needs of a major city. It contained 36 rooms including five wards and 12 private rooms, and could accommodate as many as 70 patients. The operating room was downstairs near the kitchen, and there was a chapel on the third floor next to the large public ward where patients could hear the sermon. It was a subscription hospital; the miners paid monthly dues for care at the facility. But as Virginia City’s mines gave out, dues fell off and the sisters could no longer maintain the hospital in good order. It was given to the county in 1897 and eventually closed in 1940. 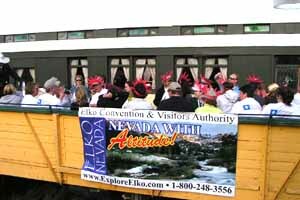 The Wine Train was only one of the perks the volunteers received in Virginia City. Lots of smiling faces on the wine train. Since 1964 it has been St. Mary’s Art Center, with an active artists-in-residence program of instruction. But it wasn’t all work. 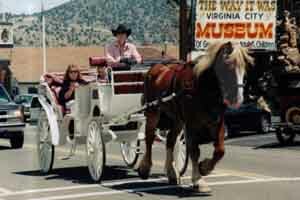 Virginia City responded to the volunteer effort by throwing some memorable parties. There was an oysters and champagne reception to get the event off on the right foot, and on Friday a barbecue, a ride on the Wine Train, and a performance by the Comstock Cowboys at the Opera House. 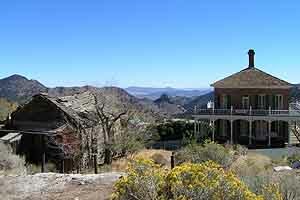 Virginia City is one of the nation’s historic treasures. 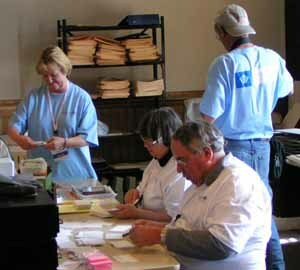 After the dust settled and the volunteers had gone home, Virginia City was just beginning to measure the impact of the event. In one day, the Tourism Cares volunteers did an enormous amount of work, with immediate and obvious benefit. 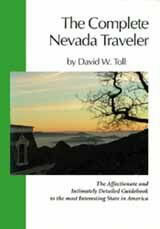 Virginia City caters to visitors each year. 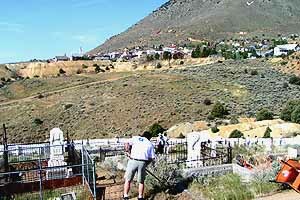 There are now nearly 300 people in the tour business who will never forget Virginia City. 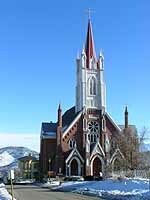 They invested a day of their lives here, had a great time in the process, and will exert a benign influence on Virginia City’s behalf for years to come. The generation that knew Virginia City from the weekly “Bonanza” television show is giving way to younger successors. For them the visit was a revelation. With all the attention being paid to the Virginia & Truckee and the Nevada Northern railroads, how about a cheer for the Nevada Southern? 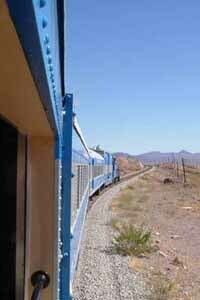 The trains depart from the station at 600 Yucca Street in Boulder City and proceed west about three miles to the Railroad Pass Casino, about a 45 minute round trip. The train usually consists of three air-conditioned/heated cars, an open-air car, and a generator car to supply power for lights, air conditioning and heating. The train is wheelchair accessible. 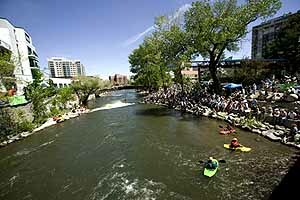 The Reno River Festival brought nearly 33,000 attendees and 72 of the world’s best professional kayakers to the Truckee River Whitewater Park in downtown Reno in May. The track was laid by the Union Pacific Railroad in 1931 as a spur off the main line through Las Vegas, to deliver materials for the building of Hoover Dam. With installation of the last enormous generator at the dam, the need for the line diminished. The rolling stock was dispersed and the tracks left to rust under the desert sun, their surfaces no longer polished by the wheels of passing trains. The maintenance facility was built in 1996, the platform in 2000, and the first public run was the “Santa Train” in December 2002. The name “Nevada Southern Railway” was chosen as a complement to the “Nevada Northern Railway” in Ely. 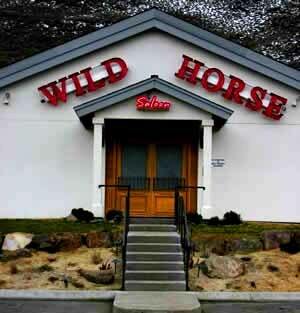 . .
Wild Horse Saloon, west of Sparks: The first second-generation “adult theme park”? whorehouse in all of Nevada until the feds grabbed it. Joe Conforte, its legendary proprietor, had made it to Brazil one step ahead of the IRS, and still lives there, now in his 80s, in a penthouse apartment overlooking the beach at Ipanema. Lance Gilman couldn’t use the Mustang Ranch name for the brothel he opened at the far eastern end of Storey County, so he called it The Wild Horse Ranch and put up billboards advertising it along I-80. I wrote 20 years ago that Joe Conforte would one day be recognized as the man who transformed Nevada’s brothels into an industry, just as Pappy Smith did with the gambling dens in Reno. Lance Gilman has played the Bill Harrah role, capitalizing on Joe’s pioneering efforts and carrying the concept into a new dimension, and now others are following him. Carson Valley is inviting everyone to see how gorgeous it is there in early summer with two weeks of enjoyable activities in the historic towns of Carson Valley and Topaz Lake. It’s called MAGIKO, and begins June 22 with the Wings of Change Air Show at the Minden Airport. There’s a Golf Tournament, running and bicycling, an arts festival with wine and food tastings, a free outdoor concert featuring Ambrosia and Gary Wright, and as a grand finale on July 4, the Annual Pops in the Park Fourth of July celebration with the Reno Philharmonic Orchestra . 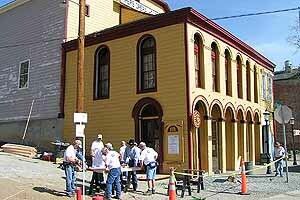 . . On June 9 Piper’s Opera House in Virginia City presents Jazzin’ up the Comstock, noon til 6 pm, $15 in advance, $20 at the door. And right after that there’s a Rhythm and Blues Barbecue at Seven Mile Canyon Ranch, about 2 miles toward Reno, $10.00 per plate for the Barbecue and the music is free . . . The Carson City Rendezvous is an astonishing assembly of Old West archtypes, from the mountain men of the 1820s and ’30s to the nearly modern Victorians of the 1890s. It sets up at Mills Park on the east side of the city, and it’s a great family event with food, entertainment and lots of history, June 8 – 10. . . . The mormon crickets that have disgusted northern Nevada over the past few years have yet to return to populated areas this year, although a new generation has been spotted in the outlying sagebrush.